In lakes, rivers and estuaries throughout New Zealand, groups of aquatic flying carpets are mobilising and moving downstream towards the sea. 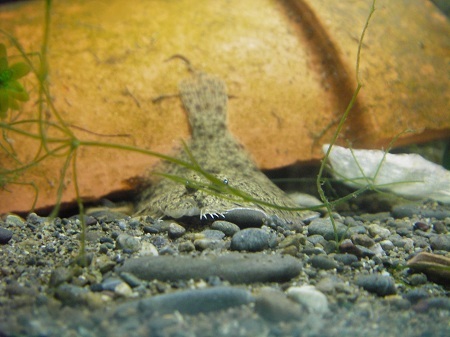 Late autumn marks the time when a special species of New Zealand flatfish – the freshwater black flounder or patiki – embarks upon a spawning migration to the sea, with juveniles re-entering freshwater and migrating back upstream a few months later. The endemic black flounder, Rhombosolea retiaria (Photo: Alton Perrie). The black flounder (Rhombosolea retiaria) is a truly fascinating native freshwater fish species. They are found mostly in freshwater, in lakes and streams close to the coast, although they have been known to travel as far as 250km inland! They also complete migration-like movements in marine environments, some of which can be astonishingly large – one flounder that was tagged during a research study in the Wairarapa turned up in Taranaki a number of months later! Black flounder usually grow to around 20-25 cm in length (although one was found that was 45 cm long! ), are dark in colour, and often have distinctive, brick-red spots. Like many flatfish, the black flounder possesses special cells called chromatophores, which enable it to rapidly change colour and patterning to blend into whatever background it happens to be sitting on. Relatively little is known about black flounder habitat use; they are found occupying a variety of substrates, from silty to cobbly bottoms, and a variety of waterbody types, from lakes to rivers. 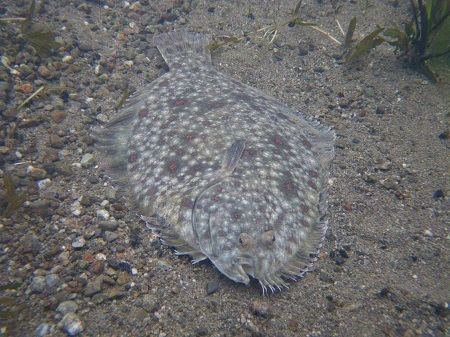 Adult flounder are predatory carnivores – camouflaging themselves on the bottom then ambushing small fish. Unknown to most people, baby flounder actually look the same as most fish when they hatch – they have an eye on either side of their head and they swim ‘upright’. When they are about a centimetre long, one of the eyes migrates across to the other side of the head, and the miniature flounder sinks down to the bottom to live the rest of its life ‘lying on its side’. Amazingly, the adoption of a flatfish lifestyle has evolved more than once. This is known because there are two distinct groups of flatfish – ‘right-eyed’ and ‘left-eyed’. The black flounder is a right-eyed flatfish – the left eye migrates over so both eyes are on the former right side of the body. Despite their cute appearance, black flounder are ferocious predators of small fish (Photo: Amber McEwan). The black flounder is only found in New Zealand and it is the only freshwater flounder (of the right-eyed family) in the whole world. This makes it yet another of New Zealand’s most unusual stars. They are difficult to observe as they so often live in deep or murky estuarine environments, however they can sometimes be seen with a powerful torch at night, particularly in shallow coastal streams with clear water (usually spring-fed). Ask at your local Regional Council or DOC office if there are any known records of black flounder in small, clear streams in your area. You can help black flounder by looking after waterways, reducing pollution and working to reduce the impact of migratory barriers, as well as spreading the word about these fascinating and unusual animals! One seen tonight (4 January 2019) about 20cm long at the mouth of the Fraser river where it joins the Clutha river, upstream from Alexandra, Central Otago, while trout fishing.